Good news, the “Press This” button is now back and working. See more information from Hugh’s Views and News here. Use this URL to find your “Press This” button. I went to my admin panel and could not find it. As Bloggers, we love the tools that make our blogging experiences easier and more efficient. 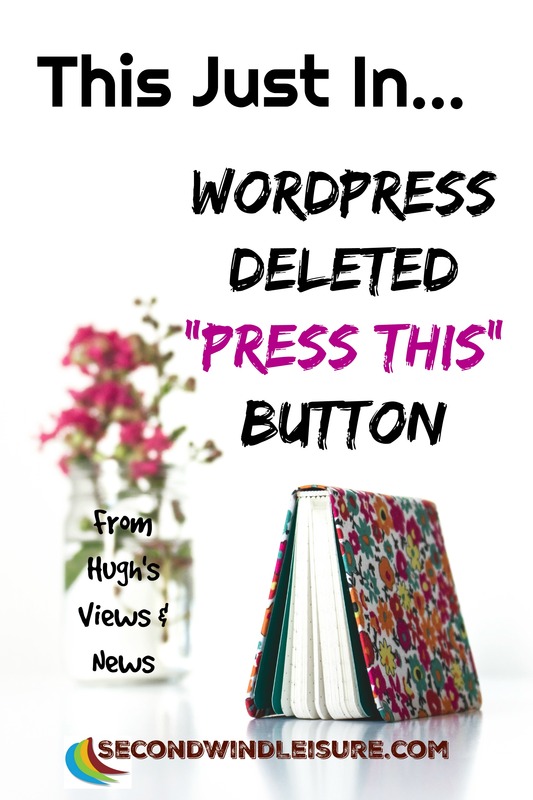 In most cases, WordPress dot com makes that process easy for us, until I read this post today from fellow blogger Hugh, of Hugh’s Views and News. What options are open to users of the WordPress blogging platform now that WordPress have deleted the ‘Press This’ sharing button? Note: this only applies to users of WordPress dot com. If you are self-hosted using WordPress dot org, you can still use the “press this” tool. Another blogger, Sue Vincent has some things to say about this subject as well! Please read more from Hugh! My only caution to this as far as sharing or re-blogging another blogger’s post, is to create your own image. I don’t recommend using the same image from the blogger’s post for a variety of reasons. Creating your own image graphic is good practice anyway! Hi, Terri. Thanks so much for sharing this information from Sue and me. Thanks, Terri. Have a great week. On Thursday, I’m meeting up with three other bloggers in Southern California (Donna Connelly, Kathy Gottberg and Janis Heppel–you know them), so excited! Have a great day, yourself! Hi, Terri – I was at a WordPress Conference this past weekend, so I heard about the discontinuation of ‘PressThis’ for WordPress.com. I am self-hosted, so should not (currently) be affected. I do make my own images when sharing other people posts on my site, but so I understand completely, what are the dangers of sharing their image directly (as long as I share their post as well and give them credit for this)? Since I’m not tech savvy, I appreciate you pointing this out to us. I’ve never before thought about using someone else’s image should I share their blog on my site, but your brief warning made me instantly aware about potential dangers. Thanks for a really useful article, Terri. I am always happy to pass along good info to the blogging community. Thanks for sharing your thoughts on this, Terri.